The Terriers are heading to Fargo, North Dakota. 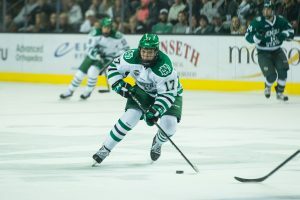 Slated against the University of North Dakota, the Boston University men’s hockey team is a part of the NCAA Tournament’s West Regional. The two sides, which met in the 2015 Frozen Four, will clash on Friday night at Scheels Arena in Fargo. UPDATE: Click here for our story over on The Daily Free Press. Upon first glance, BU isn’t all too worried about the hostile crowd out in Fargo. What’s your reaction to BU’s destination and matchup? Feel free to share below! In our next installment for the “Best of 2014-15” BU hockey season recap, the Boston Hockey Blog went through the difficult task of narrowing our favorite games from last season down to 10 picks. A tie most certainly wasn’t the result BU wanted, especially given that BU on paper was a much stronger team than Wisconsin. But in a lot of ways, it exemplified what the Terriers were made of this year — even when they were buried in a hole, they managed to salvage at least a somewhat adequate result. This is the game where that ugly, ugly own goal happened, where a puck that Matt O’Connor should have had under control ended up hitting Brien Diffley in the head and careened into BU’s net. But Ahti Oksanen scored two goals in the final 1:51, including one with 2.2 seconds left, and BU eked out a 3-3 tie. BU’s first of six overtime victories during the 2014-15 season was generated from freshman center Jack Eichel’s first of three OT tallies on the year.Following along with a trend set throughout the season, BU entered the final period of play down, 2-0, against the Black Bears.Maine could do little to keep BU’s high-powered offense in check during the third, as junior forwards Ahti Oksanen and Matt Lane scored to knot the game at 2-2 going into the extra period.As he exhibited countless times throughout the season, Eichel then left Maine skaters in the dust, soaring into the Black Bears zone before ripping a wrister into the net to hand BU the dramatic 3-2 win. BU’s first of six overtime victories during the 2014-15 season was generated from freshman center Jack Eichel’s first of three OT tallies on the year. Following along with a trend set throughout the season, BU entered the final period of play down, 2-0, against the Black Bears. Maine could do little to keep BU’s high-powered offense in check during the third, as junior forwards Ahti Oksanen and Matt Lane scored to knot the game at 2-2 going into the extra period. As he exhibited countless times throughout the season, Eichel then left Maine skaters in the dust, soaring into the Black Bears zone before ripping a wrister into the net to hand BU the dramatic 3-2 win. 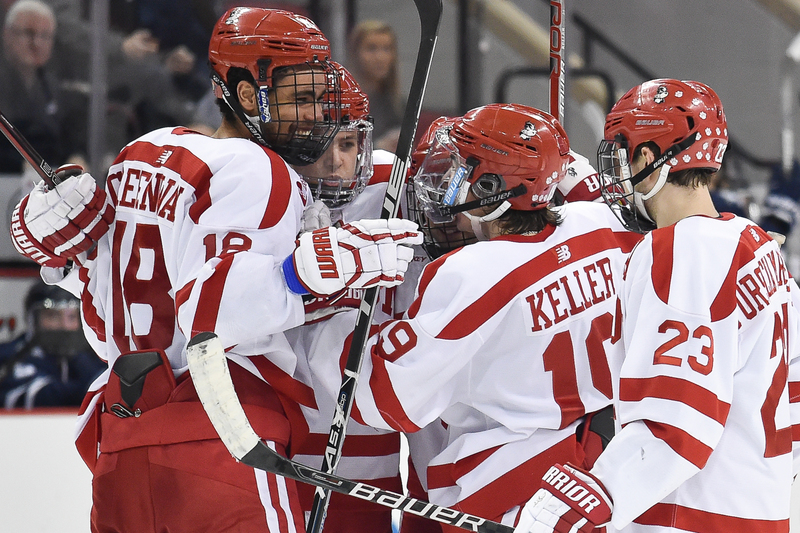 Getting the “W” against the River Hawks had proved to be a difficult task for the Terriers entering this January matchup at Agganis Arena. After posting an 0-6-1 record in its last seven tilts against Lowell, BU seemed destined to add another notch in the loss in the win column, falling behind 3-1 early in the second period. BU’s late-January road trip up to Burlington to face then-No. 12 University of Vermont in a two-game set was one of the most crucial series all season. The Terriers handily beat the Catamounts in the Friday game, 4-2, but in the second game, it looked for a while like BU might have to settle for just the two points. Vermont clung to a 1-0 lead until the final 2:18 of regulation, when Evan Rodrigues knocked home the tying goal. He later assisted on Jack Eichel’s overtime winner. 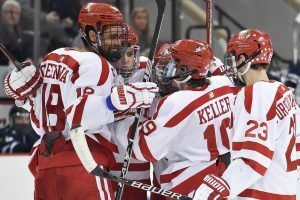 The win gave BU a four-point lead in the Hockey East standings, and also gave the Terriers an important confidence boost, according to Rodrigues. This game had a little bit of everything — blood, nifty goals (Evan Rodrigues’ golf swing early in the game wouldn’t even be his most fun goal to watch that day) and a spot in the Frozen Four on the line. Any rivalry game is bound to be entertaining, but this game, between then-No. 5 BU and then-No. 3 BC, remains one of the best games we watched all season. BC controlled play for the most part, and BU was forced to rally from three deficits in the game before eventually coming out on top in the third period. Thanks to the game-winner from Evan Rodrigues and an empty-net sealer from Nikolas Olsson, the Terriers left the BC fans at Conte Forum stunned. It was one of the biggest impact wins of the year, and it enriched the tone that BU had set in the early part of the season — you couldn’t ever count BU out, especially in the third period. BU had its hands full in its first tilt of the 2015 NCAA Tournament, facing off against a Yale squad that boasted the nation’s best defense at 1.59 goals per game. Things appeared bleak after 40 minutes, with a power-play goal from Yale defenseman Nate Repensky standing as the lone score of the contest. BU’s third-period magic once again took hold at Verizon Wireless Center in Manchester, with the Terriers outscoring the Bulldogs 2-1 in the period to force overtime. With the game on the line, Danny O’Regan managed to cash in on a rebound off of Yale netminder Alex Lyon at 7:27 in overtime, sending the Terriers onto the regional final against Minnesota Duluth. It would be a cardinal sin to leave off any Beanpot title game from this list — especially one that resulted in a BU championship. Thankfully, this one lived up to the hype. The conclusion to the 63rd annual Beanpot Tournament had a little bit of everything, with BU jumping out to a 3-1 advantage before a late run by the Huskies forced overtime — with both teams deadlocked at 3-3. The Michigan game, for all of us on the blog, stands as one of the earliest moments in the year where we first thought, “wow, maybe this team could actually be pretty good.” The Terriers had shown flash in games prior to that — BU’s 8-1 win over UMass was fun to watch, and of course, OC’s first career shutout against Michigan State the night before the Michigan game was a big win. But at the time, then-No. 14 Michigan was BU’s toughest test so far. And BU found themselves in a 2-1 deficit entering the third period. But as they would become known for as the season progressed, the Terriers rallied in the final frame, with Jack Eichel scoring the tying goal and Matt Lane giving BU a 3-2 lead with 3:10 left in the game. It seems rather fitting that the longest game in Beanpot history stands as our favorite game from the 2014-15 season. 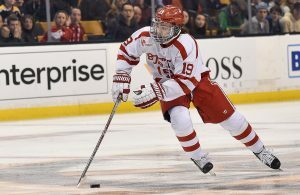 In a game that featured yet another late comeback from the scarlet and white, along with both superb goaltending from both squads and over 22 minutes of nail-biting overtime drama, the Boston Hockey Blog staff were universal in picking BU’s 4-3 victory over Harvard in the first round of the Beanpot tournament. The Terriers were on the ropes midway through this match, with the Crimson jumping out to a 3-1 lead just over eight minutes into the second period. There would be no third-period turnaround for BU on this night, however. Rather, the Terriers made use of what time was left in the middle frame, as both Nikolas Olsson and Ahti Oksanen lit the lamp to even the score. After Oksanen’s tying goal with 23 seconds remaining in the second, neither team managed to find netting for the next 42:42 of play. During that time, BU peppered goalie Steve Michalek — who set a Beanpot record with 63 saves. Ultimately, there was little that Michalek could do to stop Danny O’Regan’s bid in double overtime. With just over two minutes eclipsed in the period, Evan Rodrigues intercepted a pass in the Crimson zone, holding onto the puck before feeding O’Regan in the slot. 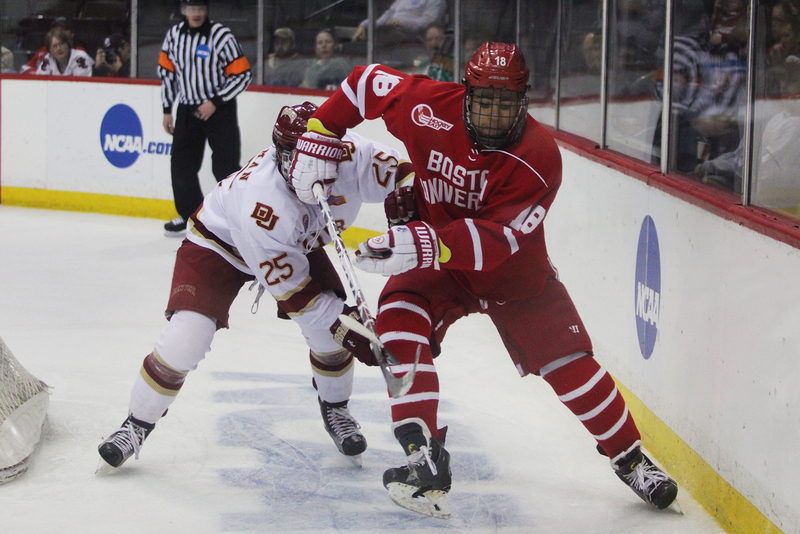 O’Regan tipped the puck past Michalek to send BU off with the dramatic 4-3 win. The selection show is over and the bracket is set for the 2015 NCAA Tournament. 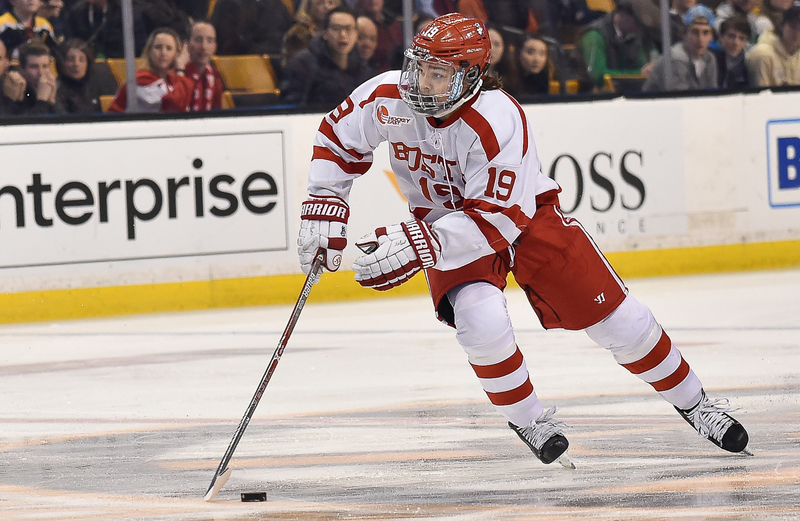 For the third time this season, the Boston University men’s hockey team will play in the state of New Hampshire. The Terriers were given the No. 3 seed overall and the top spot in the Northeast Regional that will be played in Manchester, New Hampshire. BU will face Yale University on March 27 at 2:00 p.m. in the first game. Although they haven’t played Yale, the Terriers are 3-2-1 against ECAC opponents this season. Along with BU, Hockey East schools Boston College and Providence College are among the 16-team field. The other No. 1 seeds include Minnesota State University Mankato (the overall top seed), Miami University and the University of North Dakota.